Last week it looked like summer on the island. The sun even chased those dining outside into the shadow and terraces turned into changing rooms. It was nice to observe this ultra mix of winter and summer clothes: bare legs into heavy muddy rubber boots under daring short skirts; bare feet, milk-white legs under thick woolen way-too-big pullovers, fluttering shorts with high summer shirts. If all those international volunteers hadn’t been here, we never would have been enjoying this funny parade because the locals only came up with t-shirts. 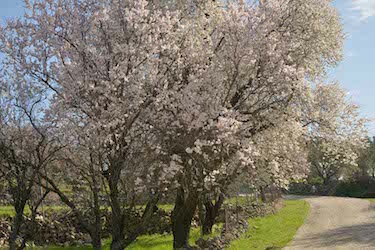 There were more metamorphoses, because everywhere on the island there were explosions of pink clouds: the almond trees – always first to blossom – tried to make Lesvos look like the famous Hanami Sakura (cherryblossom festival in Japan). There are years that these pink to white flowers are nearly made invisible by wintery bad weather and you can’t even remember that they were there. But this year the trees are so clouded with blossom that you cannot pass them without noticing. Every spring I wonder again how many almond trees there are on the island. Around Molyvos there are too many to count, but driving to the south I passed villages like Vasilika, Polichnitos and Vrisa, that are showered by the blossoms. Under the bright sunlight these villages offered such a picturesque view that you easily could forget in what an ugly world we are living today. I wonder if each tree here on the island is being harvested and what they do with all those gathered nuts (actually almonds belong to the stone fruit). I know that locals make some marzipan, but I am sure that there are so many almonds on Lesvos that Ai Weiwei could have surprised all visitors of the international Filmfestival in Berlin with a lifejacket made out of marzipan. Most almonds come from California, a dehydrating American state where more and more protests are heard against the water consuming almond growth. The fruit originally comes from the less dry Mediterranean regions and the other countries in the Top Ten of almond producing countries are: first Spain and Italy, followed by Iran, Lebanon, Pakistan, Syria, Greece, Morocco and Turkey. With so many people fleeing and so many destructive bombs and grenades I wonder if Syria still is in this Top Ten. According to the Syrian Times last year in the area of Sweiria (south from Damascus) there were 606,000 almond trees, producing some 700 tons of almonds. But when I look at the war map, I see that there must be fighting going on between the government troops and the rebels. Can you use almonds instead of bullets? In most countries the almond harvest starts in September, but in the Middle East it’s April when they start picking them from the trees — when the fruit has just taken form. Then they are still green and soft and soaking them a few hours in salt water makes the skin more soft and reduces bitterness; the fruit is considered as a great snack at this stage. You put it, skin and all, in your mouth, bite and the explosion of a little bitterness, a little sweetness and other tastes will surprise you, the ultimate joy brought by the jelly coming out of the stone. In Greece these green almonds are called tsagala, but they seem to have been forgotten. It is rare to find a salad or a wild-vegetable-dish larded with spring almonds. I have become quite a lazy cook. I used to enjoy endless hours hammering pine nuts and almonds, but nowadays I mostly buy them peeled. I love almonds and each year I want to harvest all the trees around the house. And then? I always intend to pass the long winter evenings cracking almonds, so that I can roast them or use them for a sauce, cake or marzipan. In my shed bags full of walnuts and chestnuts are waiting for the same treatment. It is only that winters – the same story for summers – are long gone when you remember you wanted to do something. That is why now I am going to watch closely the forming of this fruit and when they have their almond shape, I will experiment with this unripe fruit that asks for so little time to be made ready for consumption. No other choice left than to do it myself, because there is no Syrian Supper Club nearby. Most of the refugees reaching Lesvos come from almond countries where this fruit is a base for most delicious dishes. All refugees think that there is no future for them in Greece, let alone on an island like Lesvos. Is there not one fleeing cook coming from the Middle East who wants to apply for asylum in order to start a restaurant here? Most ingredients used in the eastern kitchen are also abundant in Greece and I promise I will come to eat weekly, especially when they serve almond pancakes. It´s hard times to get to Europe these days !